This text by JENNIFER MCMACKON was published alongside LISA NEIGHBOUR‘s Smithereens exhibition. I twist open the lid of a small specimen tin given to me as a souvenir by Lisa Neighbour at the end of a recent visit to her studio. Spilling its contents onto my notes from that day, fifteen tiny, pale green shards of automotive glass tumble out like runes. Observing where they fall, I let them rest among the scrawl of my words and doodles on the lined paper. The irregular, pebbly bits lend a changeable topography to my thoughts as recorded there. With the tip of my forefinger I separate them out from each other, herd a few of them inside a thought bubble, punctuate some key phrases with others. Then I gather them up in my fist and toss them again. A meditation such as this connotes the use of a peculiar Ouija Board capable of generating visual compositions in addition to the voices of spirits. I am unsure what I wish to divine, but I persist. Though I don’t have a clear question, I become immersed in an emergent cycle of pattern and image as I continue to animate the glass. I find myself recalling a motorcycle accident at the end of our childhood cul-de-sac. The details don’t matter. It was horrific for those involved. What I remember distinctly was my view of what came afterwards. A few policemen were placing orange pylons here and there along the road. Another was swishing glass with a broom. It was so hot that day, there were vapours of steam emanating from the pavement. I remember at times the men seemed to disappear behind the wisps of steam and the road flashed oily as tar in the sun. I could hear voices, but not words. Suddenly, I’m struck by the depth of my engagement, in this quiet reverie. I’m murmuring a little song to myself and I have just the vaguest sense of the lyrics. What is it? The lyrics formulate but without a recognizable tune…shall we go you and I while we can, through the transitive nightfall of diamonds? I’m at home alone, under the light of the computer, lost in a game of sparkly car crash dust. Ironically, these skittering little curbside gemstones were born of a noise that was likely rather a lot louder than the sound they make as I push them around the surface of my papers. Implicit in their very geophysical existence is at least the bump of misadventure or worse, a catastrophic kaboom. The traffic rear-enders, deflated dirigibles and shipwrecks depicted in Neighbours fledgling series of drawings and screen prints called Smithereens are also post-kaboom – sharing a certain distance from the bombast of trauma with their namesake. There are plenty of art historical reverberations too. Consider the booming, speeding, manifestos of Dada and the Futurists. I find myself thinking of Andy Warhol’s images of fatal car accidents and Vija Celmin’s television and disaster paintings. There may even be something a little R. Crumb about these works too, if I think about it – something a little car crash in Peoria. Except wherever Neighbours drawings may be set, it’s nowhere near discernable as Peoria. 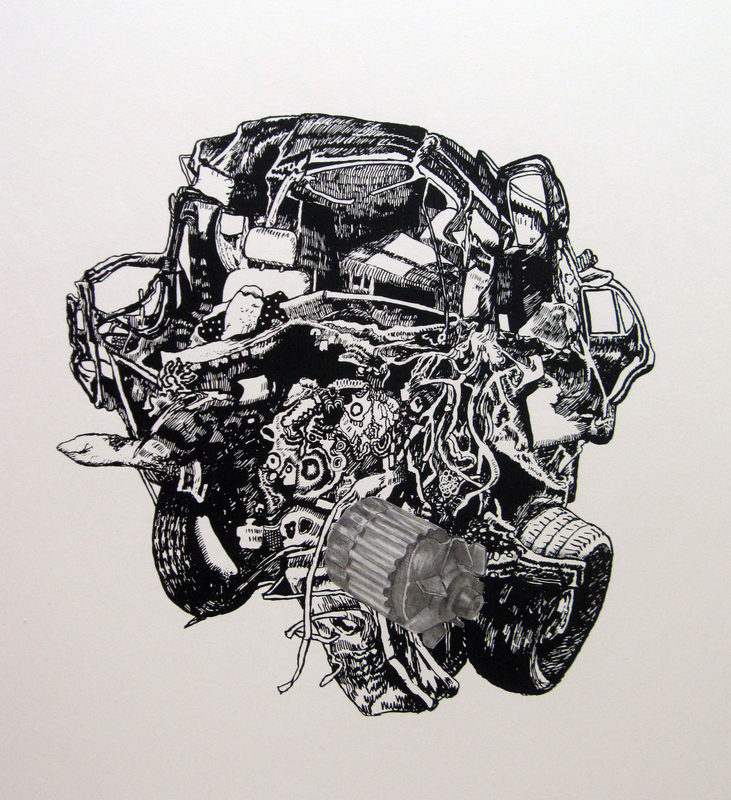 Each drawing in the series portrays in isolation the skeletal remains of a large demolished vehicle (or two) sagging in the aftermath of a long dissipated thud. An impression of the passage of time is embedded formally in each work as destroyed vehicular prototypes are culled from newspapers and other sources of media. Much of each drawing is then traced by hand through a quasi-transparent vellum prior to its development as a screen print, or further articulated as a drawing. This remove lends the images a certain stasis on the picture plane. They seem to float without moving via invisible registration pins, extracted from the landscape and repositioned in the merest suggestion of a ground. A few of the prints, featuring a particularly distressed and mangled bus are overlain with after-drawing and painting. In two of these, the bus secretes large droplets of dark, sticky blood. Gruesome and a little clumsy, they contribute jarringly interesting compositional elements to the pictures. The droplets are opaque, dark and blobby, suggesting a biological process – possibly something fecund and mushroomy occurring in circumstances it normally could not. Is it a metamorphosis? Comically over-scale in relation to the body of the bus, in Bloody three large drops almost appear to support its weight even as they spill out of it. In another print of the same bus entitled Leaking, Neighbour allows a different sort of liquid to exude from the wreckage. This time it’s something clear and puddly reflecting a pencil drawn mirror image of the bus upside down, a peculiar Rorschach test. The pencil work has a delightfully soft teenage-sketchbook quality that is magnified under an acrylic gel medium. A gasoline rainbow seems missing, no, perhaps just barely there in the saline, mirrored bus spill. Or do I desire to see a rainbow where there is none? The drawing makes me double-check. It toys with my line of sight. These quirky extra layers of imagery with their awkward baubles of ooze disturb the pristine registration of the pathways of Neighbour’s post-traumatic panhandle – pushing the viewer into the realm of conjecture. The nature of these stains in such a select few works is uncertain but it starkly contrasts the lacy dry rot, the uniformly rusty condition of her unwaveringly burned out scenarios. It’s an almost wanton performance, yet very specific. Something wet is here. It goes on last, after the tracing is done and the image reproduced. It seems required and necessary. It refracts light. It has weight. It is coloured. It interrupts the tracery, dampening dust and infiltrating structures. Post-kaboom, there are still liquids on the planet. What’s left after catastrophic events have passed? An artist reaches for a jar of paint the colour of languished oxygen starved blood….Shall we go, you and I while we can, into the transitive nightfall of diamonds? A risky and exciting new visual lexicon emerges. JENNIFER MCMACKON is a visual artist and writer who lives in Toronto.